Once you have connected the survey to the database and uploaded the published survey to Snap WebHost, this worksheet tells you how to check that it is all working correctly. Snap WebHost only knows who to send reminders to if it has some way of knowing which respondents have completed the survey. This is done by including a paradata field in the survey which identifies the respondent. When a respondent starts a survey, Snap WebHost records this, using the paradata field. When the survey is submitted Snap WebHost records that respondent has completed the survey and does not send them a reminder. 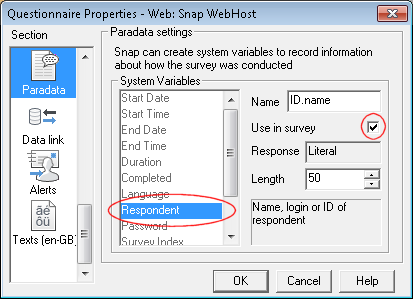 You need to add the paradata variable ID.name to the survey, so Snap WebHost can record the respondent status. Open your survey and display the Questionnaire window. Click on the Questionnaire window toolbar to display the Questionnaire Properties dialog box. Scroll down the options on the left to locate the Paradata section. Once selected, highlight the Respondent field and check the box marked Use in survey. Press [OK] to return to the questionnaire. The ID.name variable will appear below the title. Select it and right-click to display the context menu. 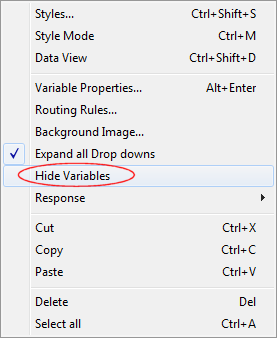 Select Hide Variables from the menu. This ensures that respondents will be identified when they start the survey but they will not have to complete a login. Open the survey in Snap Professional. 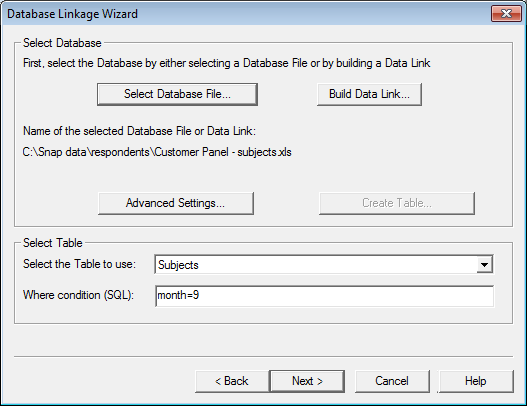 Select File | Database Link to display the Database Linkage dialog box. Click [New…] to create a new database link. The Database Wizard dialog is displayed. 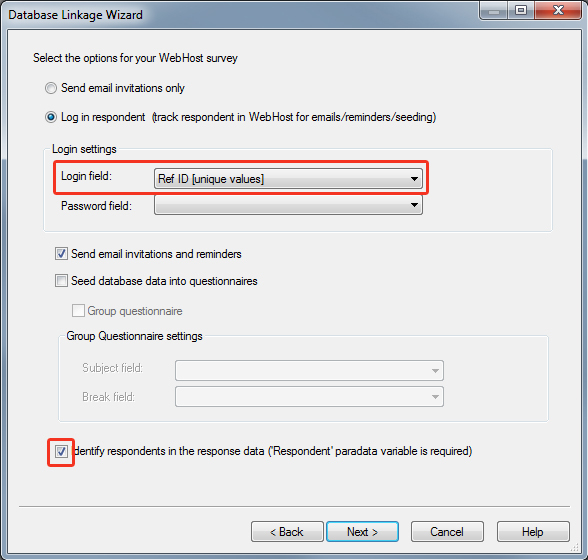 Select the WebHost Survey / Invites radio button. Click [Next>]. The Database linkage dialog is displayed. Click [Select Database File…] and browse to the Excel or MS Access file containing the respondent IDs and dataORclick [Build Data Link…] to build a link to an Oracle or SQL Database with the same information. The Select the Table to use drop-down automatically displays a table name. If this is not the table you require, select a different table from the list. If you wish to filter the respondents so that this survey is only available to some members of the database, set an appropriate filter in the Where condition box. Click [Next>]. Select the database field that uniquely identifies your respondent as the Login field. (Note that Identify respondents in the response data is ticked by default). Leave the Login from email field as Auto. This will identify your respondents automatically if the ID.name variable is hidden, and provide a login page if it is visible. Set the email address field to be the appropriate database field in the drop-down list. This will be used to provide the email address for the respondents in Snap WebHost. Type the subject heading of your email in the first box. Type the email message in the large box. Use the [Insert…] button to insert the Survey Location. The Survey Location dialog opens. By default the link text that appears in the message is Click Here, but you can change it to whatever you like. Click [OK]. The link text appears in the email. This will be made into a link to the survey when the message is uploaded to Snap WebHost. You can change or add email messages after the survey has been uploaded to Snap WebHost. Click [Next]. You will see a summary of what the database link does. Enter a name for the link and click [Finish]. Select File|Publish or [Ctrl] [Shift] W to open the publish dialog. Select the previously created link to the respondent database in the Database link drop-down list. Click [Publish]. Snap creates a zip file containing the published survey. Log in to Snap WebHost and click the Surveys tab. Click on the link . A new window opens. Click [Browse] and navigate to the folder containing the published survey. Select the .zip file containing the published survey and click [Open]. Click [Upload archive] and the survey will be uploaded. The new survey will appear in the list of surveys. Click the survey link to open the survey. Select the Respondents tab.You should have a Username column containing your respondents’ IDs, and a Completion column containing your respondents’ status. The Address column should contain their email address (in the picture below, this is the same as their ID). Select the Setup tab. If you want to identify the respondent within the survey, select Include respondent details in survey data. If your survey data must be anonymous, clear this option. Check that Enable respondent login has been selected. If not, then check that you have completed all the steps in this worksheet. Click [Save]. Select the Messages tab. Your email message should be displayed including the link text. Click Test and send an email to yourself. When the email arrives, click the link and confirm that you go directly to a preview of the survey without logging in. (Note that the emails will only link to the survey when the survey has been started). If you wish to check that the respondent details have been stored in the survey, you will need to complete a response, import it into Snap and check to see if there is a value in the ID.name variable. 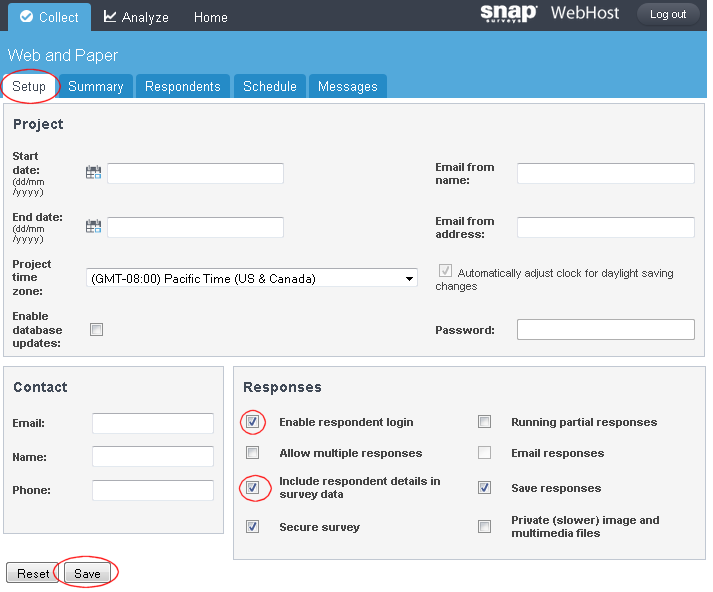 This worksheet has described how to set up a database link for Snap WebHost so that respondents can connect to the survey directly from an email. 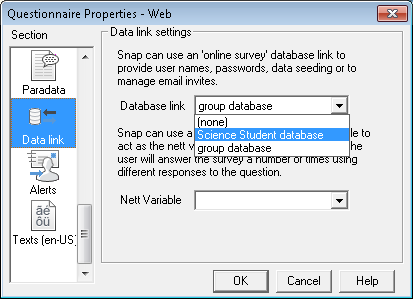 It explained how to create a database link in Snap to set up email invites including the link to the survey. It also described the difference between storing respondent information in the survey and having a completely anonymous survey. There is a step by step guide showing you how to send email invites to a customer panel in the Getting Started guide. There is a description of setting up an automatic login to a survey by writing your own command string in an email which you send yourself. For a complete list of paradata variables available, see: Paradata properties. If there is a topic you would like a worksheet on, email to snapideas@snapsurveys.com.